I have taken over 5,000 calls on the Warm Line, and I want to describe what an incredible experience that has been, and what an important resource the San Francisco Peer-Run Warm Line is for our community. I have been on the staff of the San Francisco Peer-Run Warm Line since February 2015, and have worked as a phone counselor, a supervisor and a trainer for other counselors. I am often asked, “What is a warm line?” and sometimes my answer is that it is “not a hot line”, meaning that our phone support is intended to keep callers out of a crisis – out of a ‘hot’ situation that might require a trip to the emergency room, or the intervention of crisis or emergency personnel. What do warm line callers share? Many of our calls are from those in our community who are isolated and need to know that there is hope and that someone cares about them. Many times, they are homeless or unemployed and trying to make ends meet. Our phone counselors are not doctors, therapists, parents or siblings, but we are peers, and that means that we have been there too. We know what having mental health challenges can be like and that there is hope and recovery is possible based on our own experience. I have had my own challenges meaning that I have lost jobs and housing, made trips to the psych ward and felt the stigma of having mental health challenges. I have had periods of recovery and doing well, and thinking that I was ‘cured’ followed by more problems and crises. I am not going to share the same background and experience with all of our callers, but there are usually strong similarities and areas to make a connection. At the very least, I am there to listen and that can be a powerful part of the healing process. I never know which of our callers may touch me the most – one caller “Layla” from San Mateo is suffering from cancer and undergoing regular treatments for her illness. Her family tries to be supportive, but they tell Layla that she’s a downer for them, and that she needs to “cheer up” and be more optimistic. 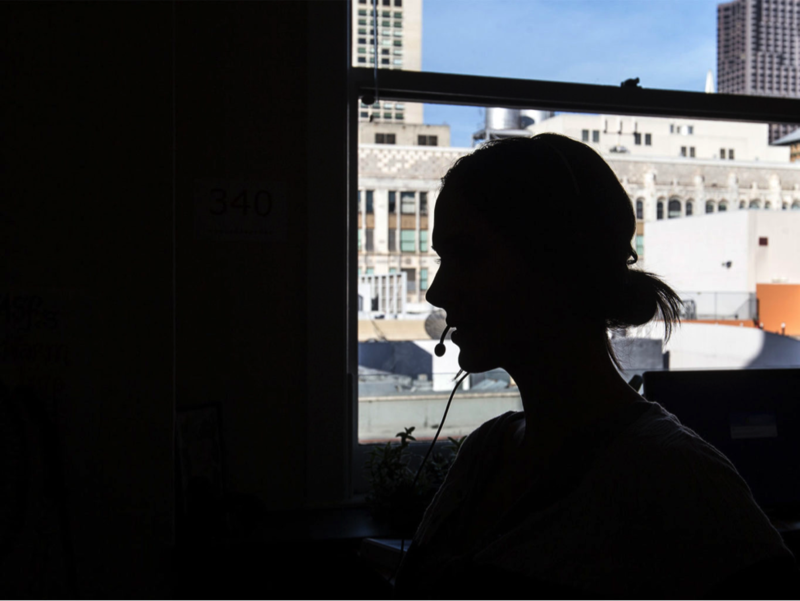 Layla lives alone and has been a regular caller to the San Francisco Peer-Run Warm Line. She has called us feeling suicidal. Part of me wants to go and visit Layla for a cup of tea and a chat, but that’s not what the Warm Line provides. We do create a safe place for Layla to make a connection, to discuss her feelings and to get support. We help her to maintain hope while she gets her treatment, and I am glad that we can be there to support Layla. Some of our callers are “regulars” and reach out to the San Francisco Peer-Run Warm Line for consistent support; others may call only once, uncertain of what the Warm Line provides, but looking for help and referrals. Warm Line services have been cut drastically over the last few months and there may be further cuts soon. We are asking for your support so that this vital service isn’t lost, and vulnerable members of our community are not shut out from this service. To join our efforts, please contact your local representatives. We have provided a sample script for San Francisco County, for people like you to voice your efforts. Please click here for more sample scripts, local representative contact information, and more ways to get involved.